I had recently reviewed a couple of other Fusions – a loaded-up Titanium with the hot-rod 2.0-litre EcoBoost as well as the other end of the fuel efficiency spectrum – the plug-in Energi Hybrid model. This time around, it was a couple of mid-level SEs. Both were identically equipped – one was a hybrid and the other had a different twist under the hood. 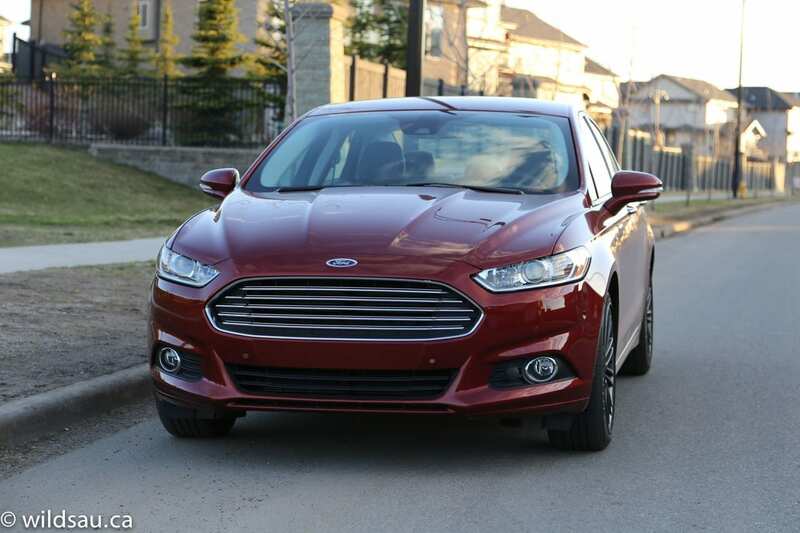 All the pictures within the review are of the gas-powered Fusion SE 1.5. The cars are nearly identical – I’ve added a few of the hybrid model after the review. 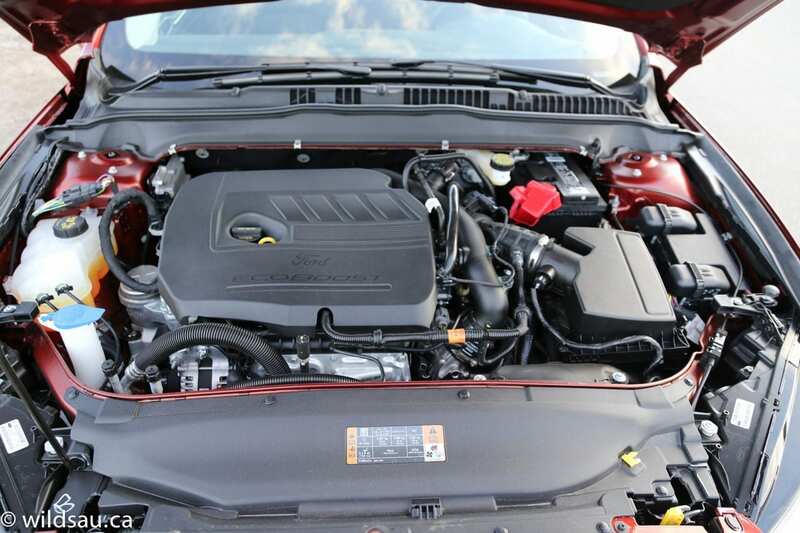 Here I found the biggest change from the previous Fusions I’ve reviewed – a brand-new engine. 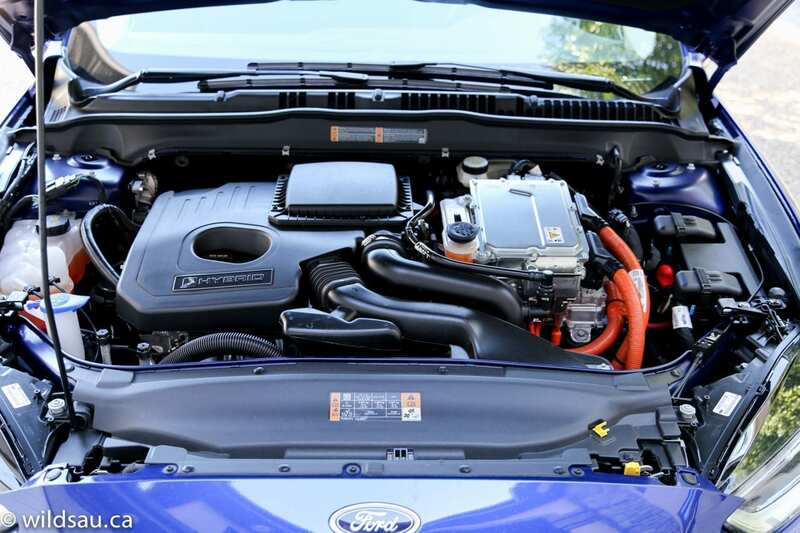 It’s smaller than ever – a 1.5-litre EcoBoost 4-cylinder. While it would have seemed ridiculous to see a vehicle this size with a 1.5-litre engine a few years (in North America anyway), we’ve come a long way, baby. This tiny thing is rated to put out 181 horsepower at 6000 RPM and more importantly, 185 lb.ft of torque at a somewhat-higher-than-expected 4320 RPM. Turbo engines tend to come up with their maximum torque at lower RPMs, and it’s usually sooner than 4300 RPM. This engine gets a 6-speed automatic and sends power to the front wheels. Fuel economy is quite decent, rated at 8.8 L/100 km (27 US mpg) in the city and 5.5 L/100 km (43 US mpg) on the highway. I ended up averaging 9.8 L/100 km (24 US mpg) during my week with it. That’s not horrible, considering the vast majority of my time is spent in slow, bumper-to-bumper driving with a few freeway jaunts thrown in. I never made an attempt to drive with a light foot either. 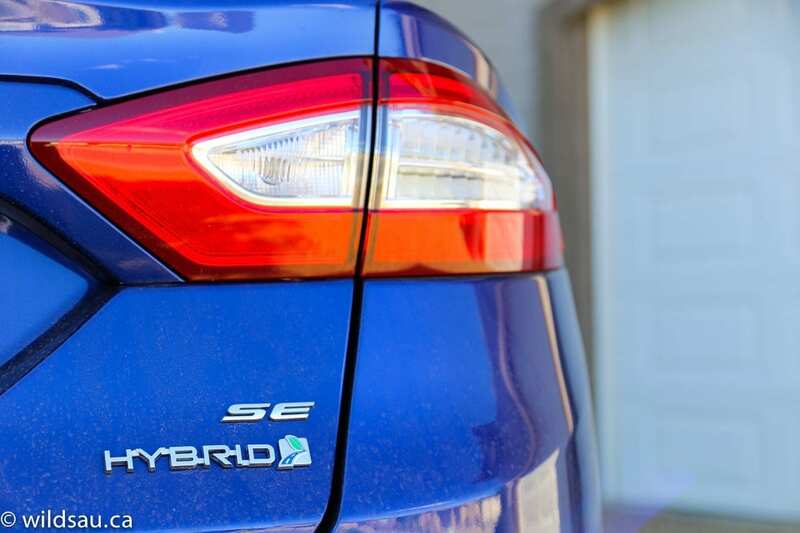 The hybrid Fusion is a different story altogether. It mates a 2.0-litre gas engine with an electric motor, and the system puts out 188 horsepower net. It also drives the front wheels through a continuously-variable transmission (CVT). Ford has rated this car at an almost ridiculous 4 L/100 km (59 US mpg) and 4.1 L/100 km (57 US mpg) on the highway. We ended up with a significantly lower but still incredible average of 5.6 L/100 km (42 mpg) during one of our standard weeks. Compare that to the 1.5-litre’s mileage and you can’t help but notice that it qualifies as staggering. In my opinion, the Fusion is one of best looking cars in its class. I think Ford has done a fantastic job with the styling. 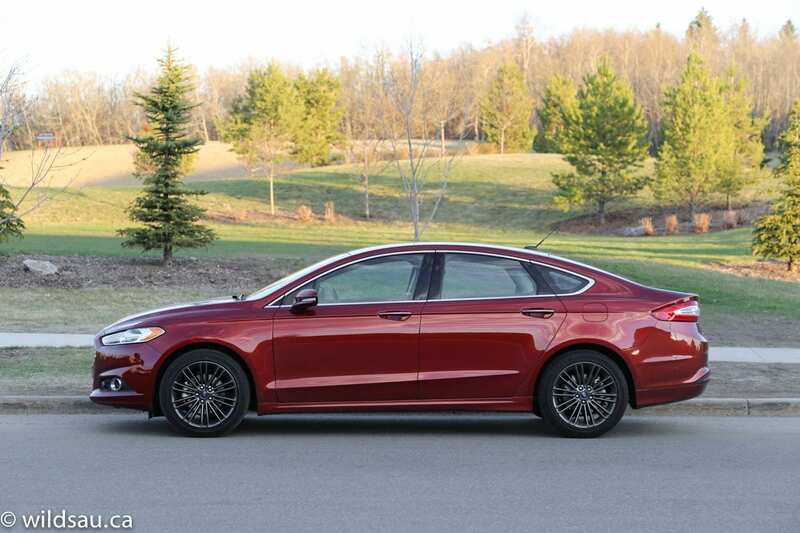 From the Aston-Martin-esque grille, the eye-catching stepped hood and steeply raked windshield to the character creases on the sides, I can’t help but think this is one the best-looking Ford sedans to date. 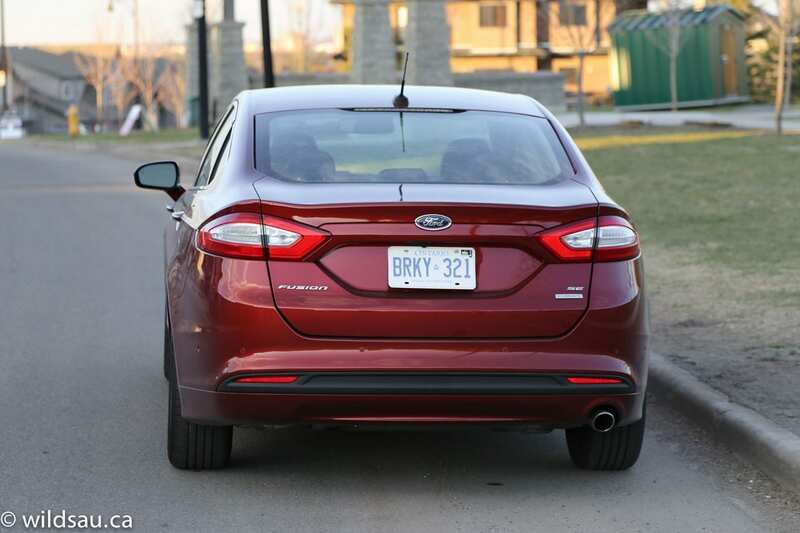 Out back, the Fusion almost looks like a sleek fastback, and it’s enhanced further by a nice set of LED tail lights. This Fusion came with optional darker 18-inch rims, which looked very handsome, and dang if that Sunset colour doesn’t just catch the eye! The Deep Impact Blue that the hybrid came in was almost as pretty. 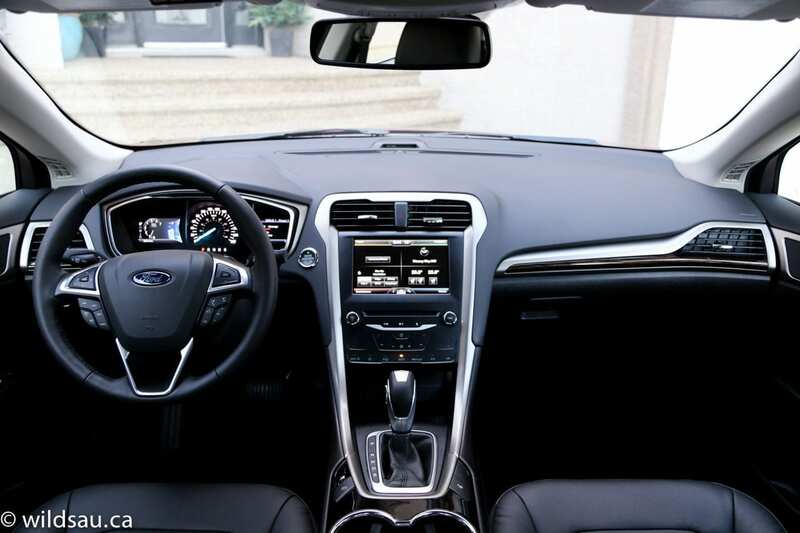 The Fusion’s cabin is spacious, with plenty of head room for my 5’10″ frame. The dash is made out of soft touch texturized plastics. While the simple, straight-forward interior styling is a bit shocking in its apparent austerity at first, its simplicity and functionality grew on me. With that said, it is a somewhat cold, lifeless place to be – you won’t find much warmth in the black plastics and bits of silver trim. 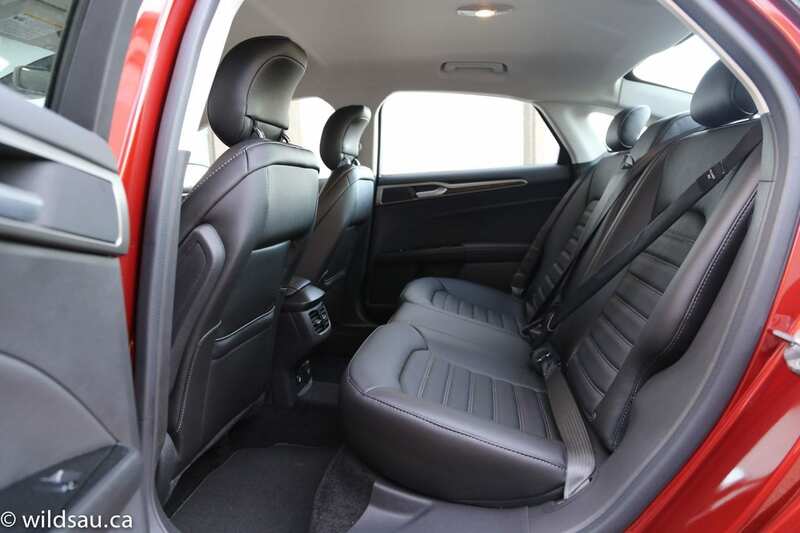 The power-adjustable heated leather seats are comfortable and very supportive. The steering wheel (with controls for media, cruise control, handsfree, phone as well as for the driver information screens) is comfortable. 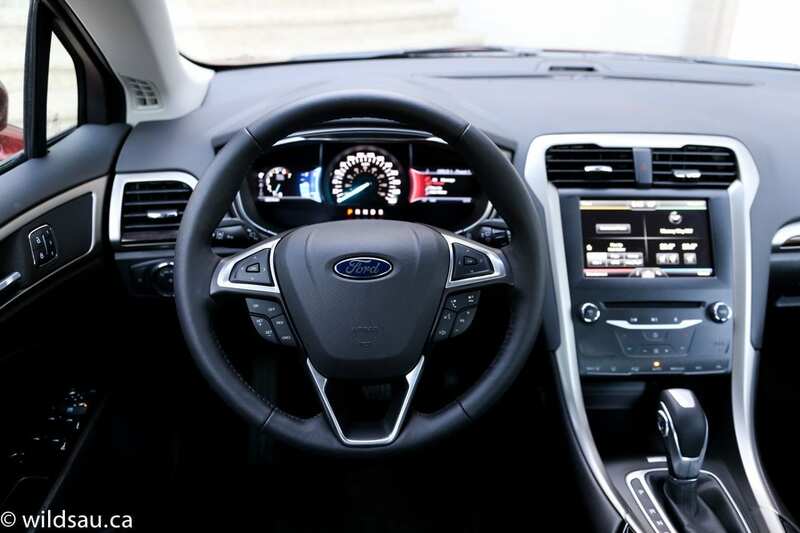 The centre stack starts with the MyFordTouch screen at the top – as always, it is split into navigation, phone, entertainment and climate control quadrants which you can tap on and drill down from there. Below it is a big area of soft buttons that work pretty well – there are controls for the major functions of the audio system and for the dual-zone automatic climate control system. 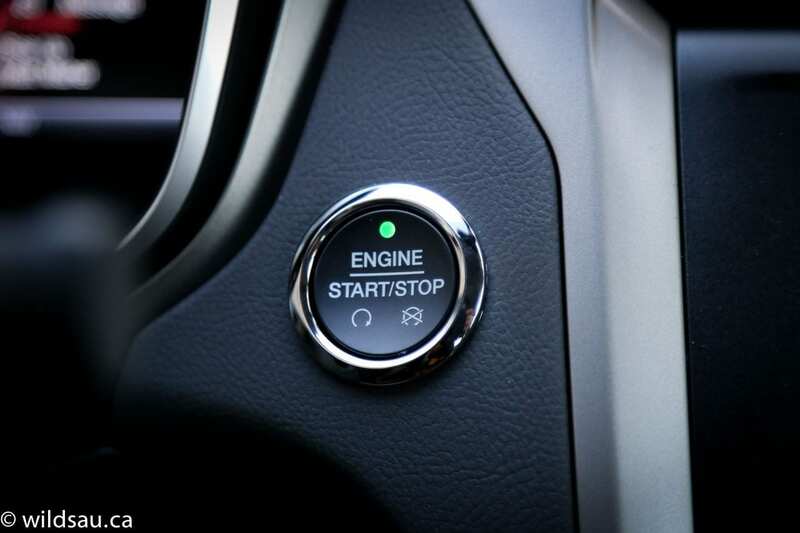 Mercifully, Ford has decided to add back two basic knobs for volume control and tuning functions – a welcome addition. 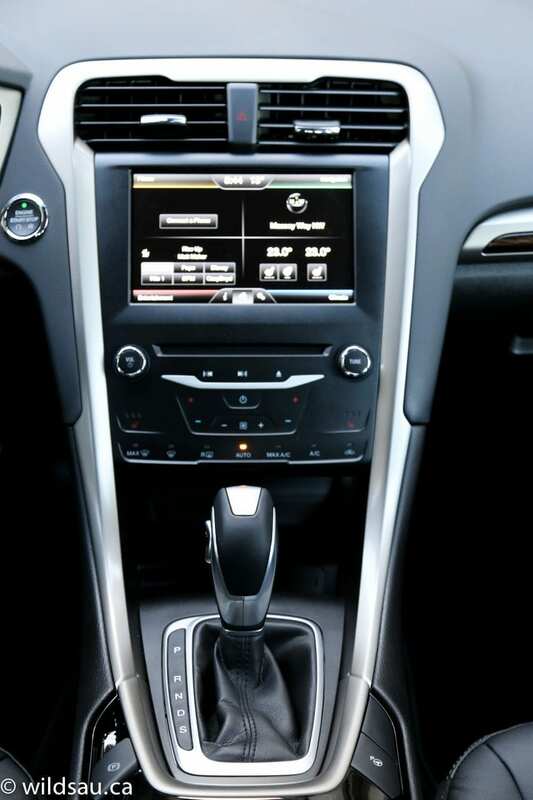 The console houses the gear selector, two cupholders and an armrest. There’s a full suite of driver assistance technology – blind spot monitoring, lane keeping technology (which nudges you gently back into your lane), front and rear parking sensors with a back-up camera and Active Park Assist. Phew! 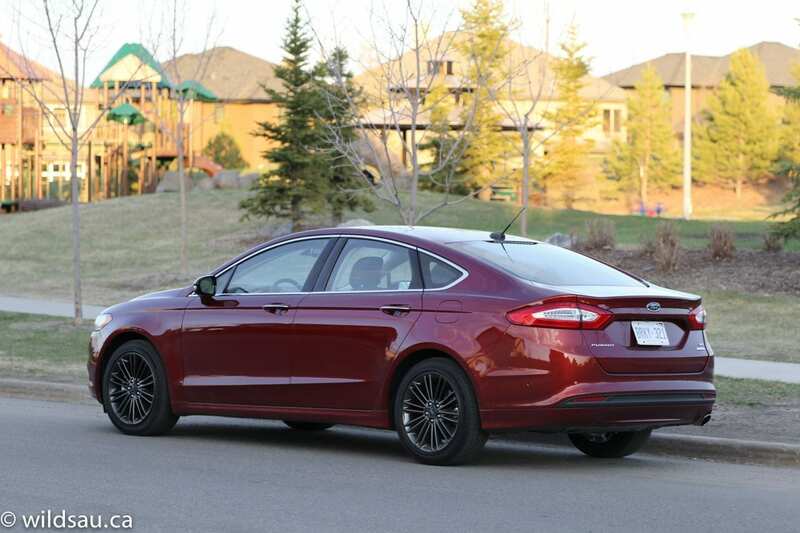 It has a push-start ignition and the non-hybrid Fusion had a typical tilt-slide sunroof overhead. The back has three seats, each with a headrest and a seatbelt. I found them to be quite comfortable, with plenty of leg room and good head room. The middle seat is the exception, as it is narrow and raised up and the center console comes back into the space – also, there’s a tunnel on the floor that the middle passenger needs to straddle. The console has adjustable air vents, a 12V and a 120V household plug – this should be the standard in every vehicle – and you also get two seatback map pockets. There are two sets of LATCH anchors for childrens’ seats. Our three kids were comfortable in terms of leg room, but width-wise, it was just enough to get by. The optional airbag seat belts are strange in that they feel a bit like a flat hose. Ford has good door bins, and you get a nice sized dual-level glove compartment. There is a large bin under the armrest with USB plugs, a 12V plug and nifty organizational stuff like a pen holder, etc. You’ll find a large deep-set open bin underneath the center stack – it has a rubberized tray and can be accessed from behind the gear selector or from either side, but it’s difficult to reach from either way – there is another 12V plug there. 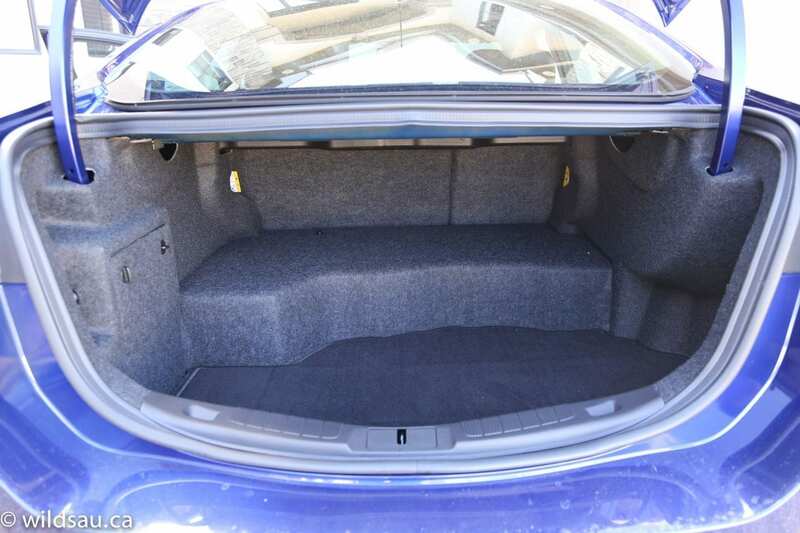 The trunk in the 1.5 Fusion is a nice size at 453 litres and I appreciate that the trunk arms are shrouded so your luggage, etc. won’t get pinched under them. The battery in the hybrid takes up quite a bit of room, and the trunk shrinks to a smallish 340 litres. It’s still useful, but would be restrictive when it comes to heading to Costco or on a road trip. 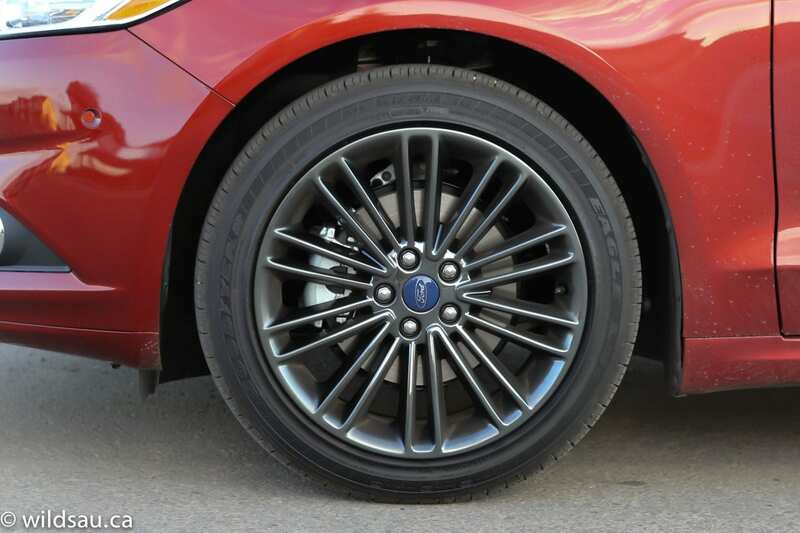 The Fusion has a solid, upscale feel on the road. Obviously I was very interested to see what the tiny EcoBoost had to say for itself, and I was pleasantly surprised by how responsive this powertrain was. It has more than enough power for everyday driving in every situation – off the line and on the go. 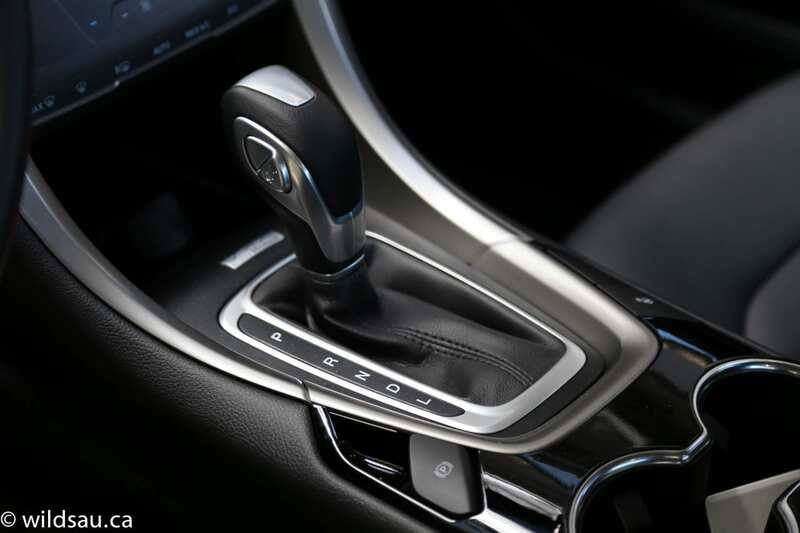 The 6 speed transmission is smooth, and relatively intelligent. It can be shifted manually with paddles, and there is a sport mode. 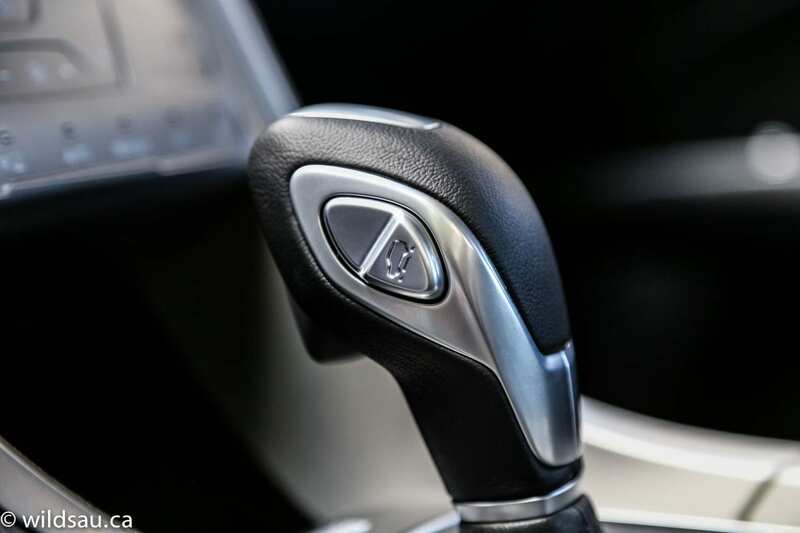 The hybrid’s CVT is obviously as smooth as can be. It offers a couple of different ways to manage your speed. There’s a Low mode, which uses engine and regenerative braking to limit your speed – as a matter of fact, it will definitely slow the car down. There’s also a Grade Assist button on the shifter, which maintains your speed on downhill grades while maximizing regeneration for the battery. It’s a milder version of Low mode, basically. 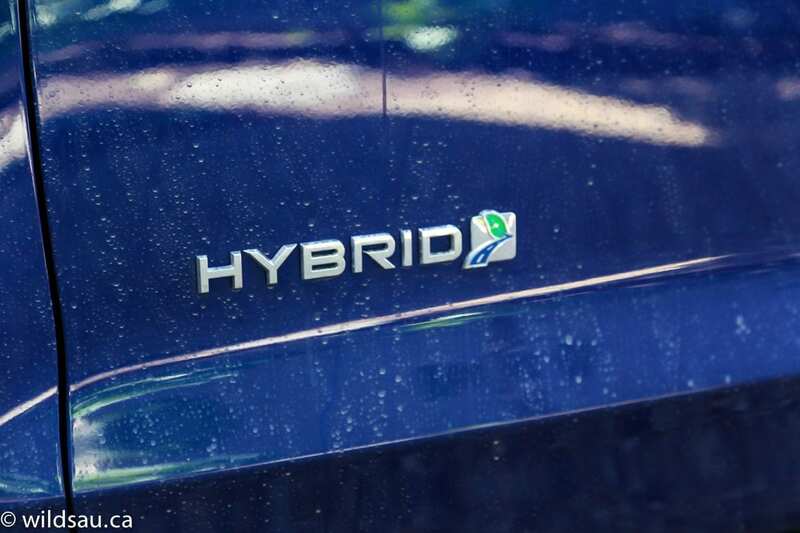 The hybrid nearly always starts on electric power during regular driving. It has surprising power, and even on the freeway, if you leave yourself a bit of space, you’ll find yourself happily cruising at high speeds. 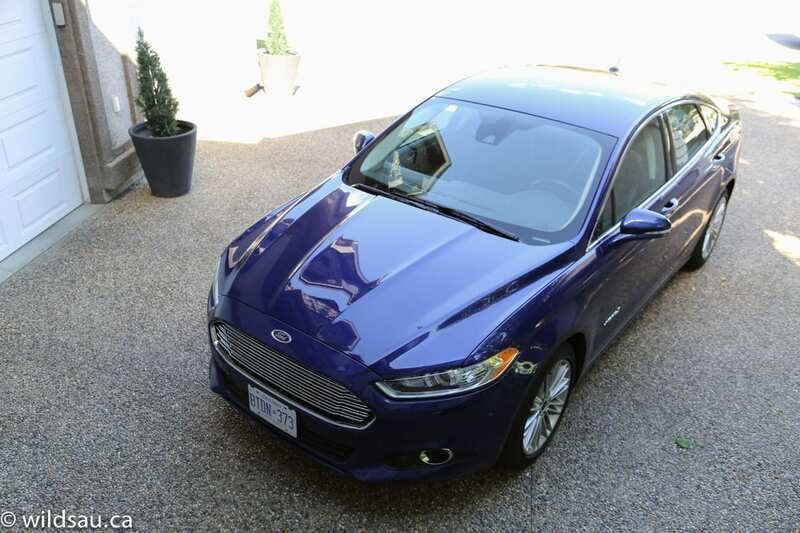 The Fusion’s ride is exceptionally refined – it’s supple, but very well controlled and has the perfect amount of firmness. The suspension soaks up big hits and keeps the cabin mostly isolated from them, and the structure feels very stiff and rigid. The word “solid” kept coming to mind. In addition, I was surprised to find excellent handling here. The electronic steering is surprisingly sharp, offering great, predictable turn-in and whenever you pick up the pace, the car feel quite agile. Yes, there’s some body roll but it always feels planted and willing. While the hybrid retains most of the great handling, it certainly feels heavier and it plows around corners a bit more. I found the Fusion to be very quiet – road, wind and drivetrain noises are very well controlled. 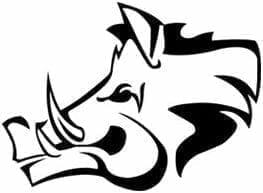 The hybrid’s gas engine can be heard when you step on it to really get a move on, but even at its loudest, it seems removed and isolated. Visibility out of the car is decent. The rear view is a bit tight, and the headrests can cut into it, but overall, it’s fine. 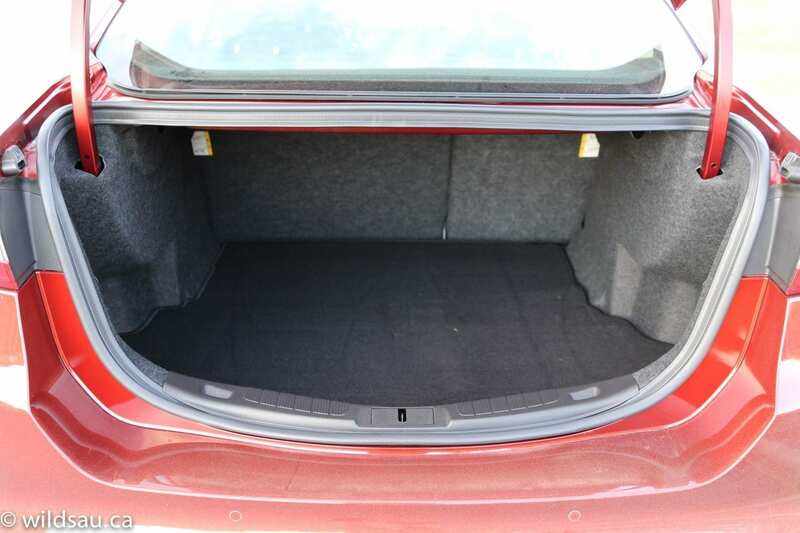 I took issue with the somewhat small trunk opening, which could hamper access on occasion. 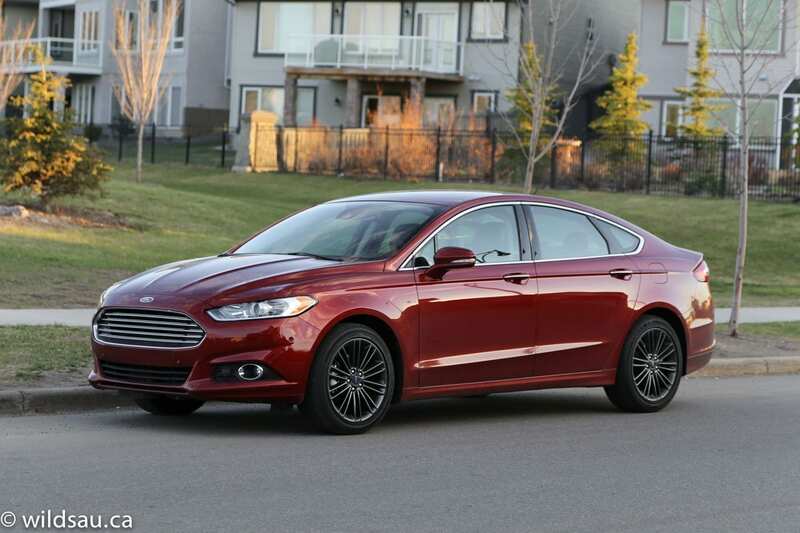 Ford has put together a very solid, upscale-feeling sedan with the Fusion. It competes in a very tight class, where every player fights tooth and nail for their piece of a shrinking pie – with so many consumers moving to crossovers these days. 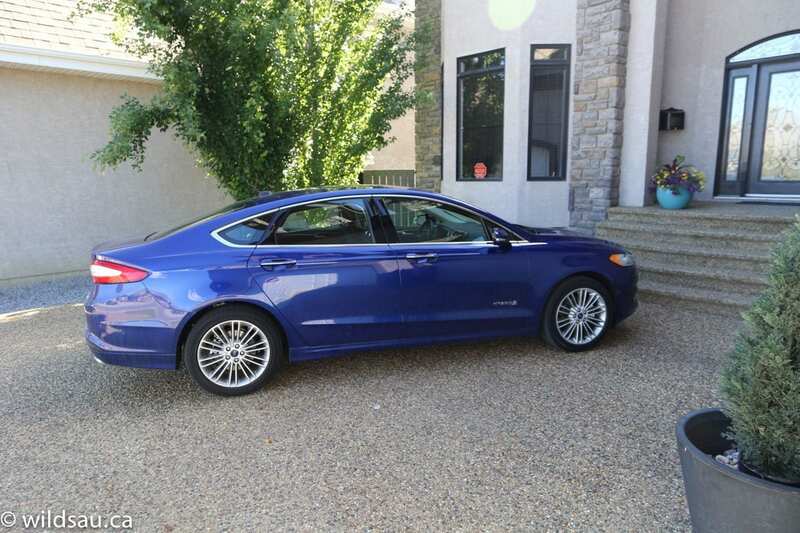 But if you’re looking for a sedan, the Fusion is a serious car. There are plenty of engine choices – ranging from a somewhat primitive 2.5-litre, a number of EcoBoost engines and a couple of hybrid variations. But the 1.5-litre EcoBoost in my review car did a fantastic job at everything. I can’t see the need to get a bigger engine, unless you like paying more for your gas expenses. I do wish Ford would stop selling the EcoBoost engines on their fuel economy. They’re really not measurably more efficient in real life situations. Why not just be honest and say “Hey guys, we’re making our modern engines smaller and smarter. You’re going to get the performance you want, and reasonable fuel economy. And if it’s really fuel efficiency you’re after, here’s our hybrid options.” That would be more representative of reality. I’m obviously smitten with the Fusion’s exterior, but wasn’t very excited about the clinical, stark interior. I can’t argue with the fact that it works well though. The technology, especially in the higher-end models, can get dizzying and anything you want or need in the entertainment, luxury and driver assistance tech departments can be had. To top it off, the car feels very well put together. 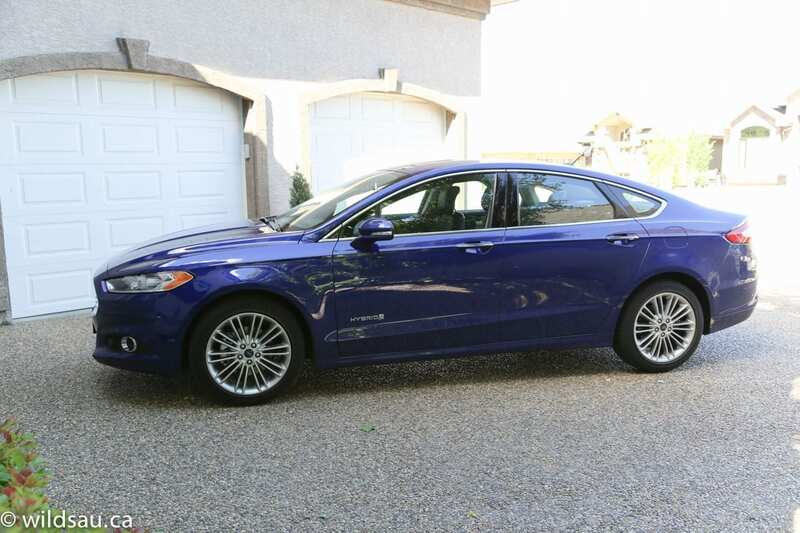 I give the Ford Fusion SE 1.5 a 7.5 out of 10 and the Hybrid a 7 out of 10. It would take quite a while to recoup the additional $4000 at the pump, and the 1.5 is such a great ride, I think it’s the best choice here. WAF (Wife Acceptance Factor) was pretty good. She liked the exterior and she didn’t take as much issue as I did with the interior. She indicated the driving experience was very nice. As I said, the Fusion has to compete with a category that’s imbued with greatness, as nearly every offering in it is a great vehicle in its own right. It is competitive, with an enjoyable drive, a (potentially) feature and tech-loaded cabin and delightful styling. Disclosure: Vehicles were provided by Ford Canada.